Are you a writer? Is there something you would like to share? If you are a woman over 40, we would love to feature your story here! 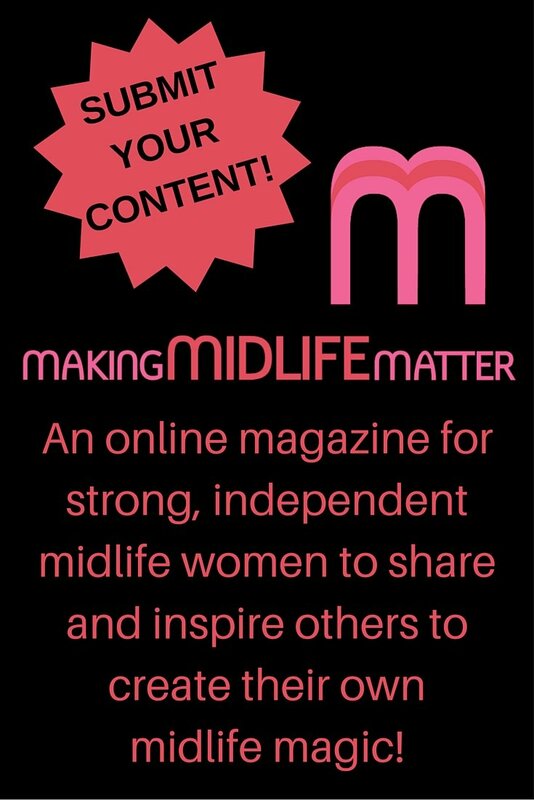 We are always looking for new writers to feature on Making Midlife Matter that celebrate, laugh at, and/or promote, life as a midlife woman. If you are interested in getting your work in front of a whole new audience, please review the types of submissions we accept below before submitting content. We are currently accepting posts, that have been previously published on the writer’s own blog, for syndication. All syndicated posts include an author bio with links to the writer’s own blog and own social media profiles. We hope by providing links to the writers’ personal blogs and social media profiles, that it will help them get not only exposure but help them grow their own audience. We do not share writers’ affiliate links within posts or on their personal bios. Though we do accept original content for submission, please understand that we do not offer monetary compensation at this time. Some topics, like menopause and empty nest syndrome, we feel have been over done in the midlife arena. Unless you have a brand new perspective or a hilarious story, please consider submitting another article for consideration. Keep in mind that personal journal type posts are also rarely accepted. We especially like to highlight stories about midlife transformation. We are all friends here. Talk to us! So why not go snoop around and check out what kinds of posts our readers are interested in and which do really well. Do you have something that fits? Make sure your post is polished and fully edited before submission. Do not submit images unless vital to your article. We will provide images for social media for you. We welcome all submissions but we may not be able to publish every article we receive. Only those that have been accepted will be contacted. Listicles are our personal favorite type of post. Please read our terms and conditions below or by clicking here. CONTRIBUTOR SYNDICATION AGREEMENT This AGREEMENT (“Agreement”) is made by and between the writer (herein called the “Writer”) and Making Midlife Matter (herein called “MMM”). TERMS 1. The Writer may write and submit article(s) to MMM for consideration. All submissions are on a voluntary basis and no compensation is either intended nor implied. MMM reserves the right to refuse, remove and/or edit submissions for publication/syndication on MMM. 2. Copyright: By submitting work to MMM, the Writer warrants that the work is original, accurate to the best of his/her knowledge, and does not infringe on any copyright. Any article(s) found to be in violation of this term will be removed. The Writer grants MMM Non-Exclusive Rights to the work for an indefinite period. MMM does not hold copyright claim to any articles submitted for syndication. 3. Confidentiality: The Writer shall not disclose any information he or she discovers about MMM’s business, technical operations, future plans, published and unpublished work both produced and not produced by the Writer, data, and other operations specific to MMM to any party or entity at the time of and following this contract’s duration. 4. Choice of Law: The laws of Ontario, Canada shall govern the validity of this Agreement, the construction of its terms and the interpretation of the rights and duties of the parties hereto. 5. Assignment: The Writer shall not assign any of their rights under this Agreement, or delegate the performance of any of their duties hereunder, without the prior written consent of MMM. 6. Indemnification. Writer shall indemnify, defend and hold harmless MMM and its affiliates, its licensees, successors and assigns, and each of its officers, agents and employees from all liabilities or losses, including, without limitation, reasonable attorneys’ fees, arising out of or related to the Website’s exercise of the rights granted herein. 7. Termination: MMM reserves the right to terminate this agreement at any time without prior notice to the Writer. 8. Entire Agreement: This Agreement sets forth the entire agreement and understanding of the parties relating to the subject matter herein and supersedes any prior discussions or agreements between them. No modification of or amendment to this Agreement, nor any waiver of any rights under this Agreement, shall be effective unless in writing signed by the party to be charged. Please check here to confirm that agree to adhere to all terms set forth in the contributor agreement. I have read, and agree to the contributor T&Cs. After you have submitted your article, please go to the Author Profile Page and fill in your information.